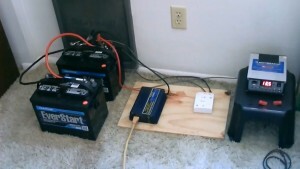 This video shows many things you can run using a Simple Two Battery (90-100w) DIY Power Generation System.A solar powered electricity generation system is a great way to power many of your basic household electronics while staying completely off the grid.It allows you to run anything from a fan to a clock radio without ever tapping into the electricity grid. By simply setting up solar panels and hooking them up to a battery system, you will be able to enjoy the energy that is harnessed right from the sun. To put the system together, all you need is a solar panel, battery, charge controller and an inverter. As long as you have these four items, you have everything you need to do this project. To start, find a location for your solar panels. Pick a sunny location that is free from any obstructions. Try to match the angle of the solar panels with the angle of the sun so that it receives as much direct sunlight as possible.